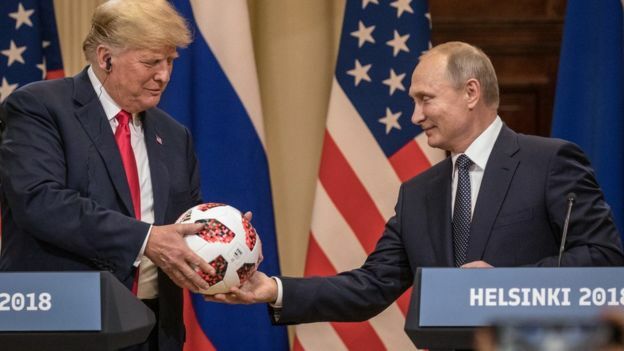 Yes, Trump went to Helsinki and all he got was a toy. When Donald Trump stood beside Vladimir Putin and did his dog and pony show, even Republicans were shocked. On Fox Business, Trish Regan and Gen. Jack Keane, they were shocked, shocked that Trump didn't do the slightest thing to defend our country, starting with his own intelligence community and the FBI. (Russian meddling that had been aided and abetted for years by the countless talking heads at Fox then decried.). NBC News reported that Brit Hume's own analysis of the summit was "disgusting" (this coming from the same Brit Hume who, ironically, used the 4th of July to say on Twitter that "Democrats don't love America") and Bret Baier called it "almost surreal at points". Fox.com's Douglas Schoen wrote that Putin "eats Trump's lunch." Yes, they're actually grateful that Russia meddled in the 2016 election because the subversion of our electoral process with the purpose of fraudulently installing a Russian stooge like Donald Trump is still vastly preferable to legitimately electing Hillary Clinton because of ... the emails! The server! Monica! Because that's how we'll make America great again, by thanking our worst enemy for hacking into the American electoral process for which our ancestors had fought and died to defend. MAGA! If any one picture could perfectly describe this Helsinki summit/debriefing/job performance review, it would be this one. 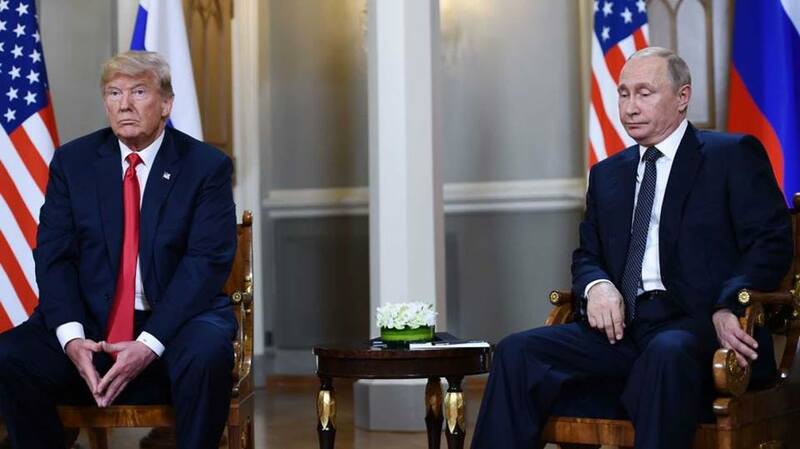 Putin sits very comfortably looking like a 10 pound cat that just ate a 20 pound canary. Trump, on the other hand, looks like a man who abruptly lost his place in a universe that no longer makes sense. One can perfectly imagine The Talking Heads' "Once in a Lifetime" playing through his head. Well, the answer was sitting to his left, looking extremely satisfied that his master plan was running like clockwork with the continuing collusion of 63,000,000 racist evolutionary dropouts who still think Trump is the greatest thing since vodka and borscht. Guilty of collusion or not, any sane president would have immediately canceled such a summit in the interests of political decontamination. Trump's top advisors begged him not to go but Trump was a man on a mission and he had to get his marching orders from the Boss. Then smack dab in the middle of the summit, this bombshell dropped over the White House and the Kremlin. Maria Butina, the Russian gun nut, had been charged with acting as a surreptitious Russian agent and establishing a secret back channel with the GOP through the NRA. That involves the entire Republican Party, not just Trump. 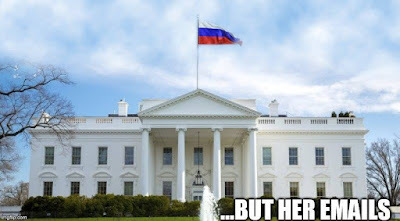 And still, the "president" got up on his hind legs and said, "No collusion" several times and even mentioned Hillary's emails and the basement server. 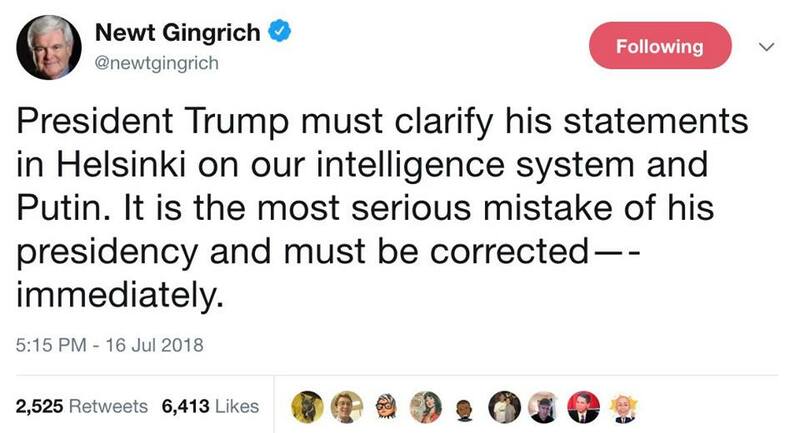 Yes, he went there. Again. 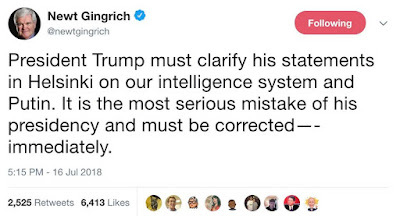 He decided to side with a murderous ex KGB goon instead of the FBI and his 17 intelligence agencies, including his DNI, Dan Coats, who recently and unequivocally said that Russia hacked the election. And then he took that beautiful toy and tossed it to his beautiful wife, in essence dropping the ball both literally and figuratively. 'My God! What have I done?'"